For other uses, see Great Barrier Reef. 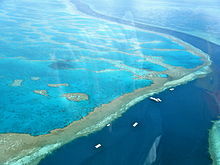 A large part of the reef is protected by the Great Barrier Reef Marine Park, which helps to limit the impact of human use, such as fishing and tourism. Other environmental pressures on the reef and its ecosystem include runoff, climate change accompanied by mass coral bleaching, dumping of dredging sludge and cyclic population outbreaks of the crown-of-thorns starfish. 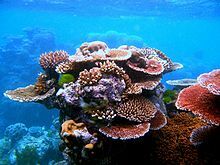 According to a study published in October 2012 by the Proceedings of the National Academy of Sciences, the reef has lost more than half its coral cover since 1985. A March 2016 report stated that coral bleaching was more widespread than previously thought, seriously affecting the northern parts of the reef as a result of warming ocean temperatures. In October 2016, Outside published an obituary for the reef; the article was criticized for being premature and hindering efforts to bolster the resilience of the reef. In March 2017, the journal Nature published a paper showing that huge sections of an 800-kilometre (500 mi) stretch in the northern part of the reef had died in the course of 2016 due to high water temperatures, an event that the authors put down to the effects of global climate change. The percentage of baby corals being born on the Great Barrier Reef dropped drastically in 2018 and scientists are describing it as the early stage of a "huge natural selection event unfolding". The reason behind low birth of new corals is that many of the mature breeding adults died in the bleaching events of 2016-17, and thus could not produce offspring. The types of corals that reproduced changed too, which points towards the fact that there will be long-term reorganisation of the reef ecosystem if the trend continues. The Great Barrier Reef is a distinct feature of the East Australian Cordillera division. It reaches from Torres Strait (between Bramble Cay, its northernmost island, and the south coast of Papua New Guinea) in the north to the unnamed passage between Lady Elliot Island (its southernmost island) and Fraser Island in the south. Lady Elliot Island is located 1,915 km (1,190 mi) southeast of Bramble Cay as the crow flies. It includes the smaller Murray Islands. The Great Barrier Reef is clearly visible from aircraft flying over it. The land that formed the substrate of the current Great Barrier Reef was a coastal plain formed from the eroded sediments of the Great Dividing Range with some larger hills (most of which were themselves remnants of older reefs or, in rare cases, volcanoes:26). :18 The Reef Research Centre, a Cooperative Research Centre, has found coral 'skeleton' deposits that date back half a million years. The Great Barrier Reef Marine Park Authority (GBRMPA) considers the earliest evidence of complete reef structures to have been 600,000 years ago. According to the GBRMPA, the current, living reef structure is believed to have begun growing on the older platform about 20,000 years ago. The Australian Institute of Marine Science agrees, placing the beginning of the growth of the current reef at the time of the Last Glacial Maximum. At around that time, sea level was 120 metres (390 ft) lower than it is today. From 20,000 years ago until 6,000 years ago, sea level rose steadily around the world. As it rose, the corals could then grow higher on the newly submerged maritime margins of the hills of the coastal plain. By around 13,000 years ago the sea level was only 60 metres (200 ft) lower than the present day, and corals began to surround the hills of the coastal plain, which were, by then, continental islands. As the sea level rose further still, most of the continental islands were submerged. The corals could then overgrow the submerged hills, to form the present cays and reefs. Sea level here has not risen significantly in the last 6,000 years. The CRC Reef Research Centre estimates the age of the present, living reef structure at 6,000 to 8,000 years old. The shallow water reefs that can be seen in air-photographs and satellite images cover an area of 20,679 km², most (about 80%) of which has grown on top of limestone platforms that are relics of past (Pleistocene) phases of reef growth. The remains of an ancient barrier reef similar to the Great Barrier Reef can be found in The Kimberley, Western Australia. Wonky holes can have localised impact on the reef, providing upwellings of fresh water, sometimes rich in nutrients contributing to eutrophication. The Great Barrier Reef supports an extraordinary diversity of life, including many vulnerable or endangered species, some of which may be endemic to the reef system. Thirty species of cetaceans have been recorded in the Great Barrier Reef, including the dwarf minke whale, Indo-Pacific humpback dolphin, and the humpback whale. Large populations of dugongs live there. More than 1,500 fish species live on the reef, including the clownfish, red bass, red-throat emperor, and several species of snapper and coral trout. Forty-nine species mass spawn, while eighty-four other species spawn elsewhere in their range. Seventeen species of sea snake live on the Great Barrier Reef in warm waters up to 50 metres (160 ft) deep and are more common in the southern than in the northern section. None found in the Great Barrier Reef World Heritage Area are endemic, nor are any endangered. Six species of sea turtles come to the reef to breed: the green sea turtle, leatherback sea turtle, hawksbill turtle, loggerhead sea turtle, flatback turtle, and the Olive Ridley. 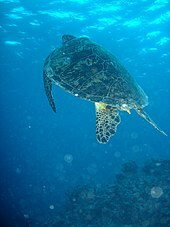 The green sea turtles on the Great Barrier Reef have two genetically distinct populations, one in the northern part of the reef and the other in the southern part. Fifteen species of seagrass in beds attract the dugongs and turtles, and provide fish habitat. :133 The most common genera of seagrasses are Halophila and Halodule. Saltwater crocodiles live in mangrove and salt marshes on the coast near the reef. Nesting has not been reported, and the salt water crocodile population in the GBRWHA is wide-ranging but low density. Around 125 species of shark, stingray, skates or chimaera live on the reef. Close to 5,000 species of mollusc have been recorded on the reef, including the giant clam and various nudibranchs and cone snails. Forty-nine species of pipefish and nine species of seahorse have been recorded. At least seven species of frog inhabit the islands. 215 species of birds (including 22 species of seabirds and 32 species of shorebirds) visit the reef or nest or roost on the islands,:450–451 including the white-bellied sea eagle and roseate tern. Most nesting sites are on islands in the northern and southern regions of the Great Barrier Reef, with 1.4 to 1.7 million birds using the sites to breed. The islands of the Great Barrier Reef also support 2,195 known plant species; three of these are endemic. The northern islands have 300–350 plant species which tend to be woody, whereas the southern islands have 200 which tend to be herbaceous; the Whitsunday region is the most diverse, supporting 1,141 species. The plants are propagated by birds. Climate change, pollution, crown-of-thorns starfish and fishing are the primary threats to the health of this reef system. Other threats include shipping accidents, oil spills, and tropical cyclones. Skeletal Eroding Band, a disease of bony corals caused by the protozoan Halofolliculina corallasia, affects 31 coral species. According to a 2012 study by the National Academy of Science, since 1985, the Great Barrier Reef has lost more than half of its corals with two-thirds of the loss occurring from 1998 due to the factors listed before. The Great Barrier Reef Marine Park Authority considers the greatest threat to the Great Barrier Reef to be climate change, causing ocean warming which increases coral bleaching. Mass coral bleaching events due to elevated ocean temperatures occurred in the summers of 1998, 2002 and 2006, and coral bleaching is expected to become an annual occurrence. As global warming continues, corals will not be able to keep up with increasing ocean temperatures. Coral bleaching events lead to increased disease susceptibility, which causes detrimental ecological effects for reef communities. In July 2017 UNESCO published in a draft decision, expressing serious concern about the impact of coral bleaching on the Great Barrier Reef. The draft decision also warned Australia that it will not meet the targets of the Reef 2050 report without considerable work to improve water quality. Climate change has implications for other forms of reef life—some fish's preferred temperature range leads them to seek new habitat, thus increasing chick mortality in predatory seabirds. Climate change will also affect the population and sea turtle's available habitat. Bleaching events in benthic coral communities (deeper than 20 metres or 66 feet) in the Great Barrier reef are not as well documented as those at shallower depths, but recent research has shown that benthic communities are just as negatively impacted in the face of rising ocean temperatures. Five Great Barrier Reef species of large benthic corals were found bleached under elevated temperatures, affirming that benthic corals are vulnerable to thermal stress. Another key threat faced by the Great Barrier Reef is pollution and declining water quality. The rivers of north eastern Australia pollute the Reef during tropical flood events. Over 90% of this pollution comes from farm runoff. 80% of the land adjacent to the Great Barrier Reef is used for farming including intensive cropping of sugar cane, and major beef cattle grazing. Farming practices damage the reef due to overgrazing, increased run-off of agricultural sediments, nutrients and chemicals including fertilisers, herbicides and pesticides representing a major health risk for the coral and biodiversity of the reefs. Sediments containing high levels of copper and other heavy metals sourced from the Ok Tedi Mine in Papua New Guinea are a potential pollution risk for the far northern Great Barrier Reef and Torres Strait regions. Some 67% of corals died in the reef's worst-hit northern section, the ARC Centre of Excellence for Coral Reef Studies report said. The runoff problem is exacerbated by the loss of coastal wetlands which act as a natural filter for toxins and help deposit sediment. It is thought that the poor water quality is due to increased light and oxygen competition from algae. Farming fertiliser runoff release nitrogen, phosphorus, and potassium into the oceanic ecosystem, these limiting nutrients cause massive algal growth which leads to depletion in oxygen available for other creatures which decreases the biodiversity in the affected areas, altering the species composition. A study by Katharina Fabricius and Glen Death of Australian Institute of Marine Science found that hard corals numbers were almost double on reefs that were far from agricultural areas. Fertilizers also increase the amount of phytoplankton available for the crown-of-thorns starfish larvae to consume. A study showed that a doubling of the chlorophyll in the water leads to a tenfold increase in the crown-of-thorns starfish larvae's survival rate. Sediment runoff from farming carries chemicals into the reef environment also reduces the amount of light available to the corals decreasing their ability to extract energy from their environment. Pesticides used in farming are made up of heavy metals such as lead, mercury, arsenic and other toxins are released into the wider environment due to erosion of farm soil, which has a detrimental effect on the coral. Mining company Queensland Nickel discharged nitrate-laden water into the Great Barrier Reef in 2009 and 2011 – on the later occasion releasing 516 tonnes (508 long tons; 569 short tons) of waste water. The Great Barrier Reef Marine Park Authority (GBRMPA) stated "We have strongly encouraged the company to investigate options that do not entail releasing the material to the environment and to develop a management plan to eliminate this potential hazard; however, GBRMPA does not have legislative control over how the Yabulu tailings dam is managed". The crown-of-thorns starfish preys on coral polyps. Large outbreaks of these starfish can devastate reefs. In 2000, an outbreak contributed to a loss of 66% of live coral cover on sampled reefs in a study by the RRC (Reefs Research Centre.) Outbreaks are believed to occur in natural cycles, worsened by poor water quality and overfishing of the starfish's predators. The unsustainable overfishing of keystone species, such as the Giant Triton, can disrupt food chains vital to reef life. Fishing also impacts the reef through increased water pollution from boats, by-catch of unwanted species (such as dolphins and turtles) and habitat destruction from trawling, anchors and nets. As of the middle of 2004, approximately one-third of the Great Barrier Reef Marine Park is protected from species removal of any kind, including fishing, without written permission. The Shen Neng 1 aground on the Great Barrier Reef, 5 April 2010. Shipping accidents are a pressing concern, as several commercial shipping routes pass through the Great Barrier Reef. Although the route through the Great Barrier Reef is not easy, reef pilots consider it safer than outside the reef in the event of mechanical failure, since a ship can sit safely while being repaired. There have been over 1,600 known shipwrecks in the Great Barrier Reef region. On 3 April 2010, the bulk coal carrier Shen Neng 1 ran aground on Douglas Shoals, spilling up to four tonnes of oil into the water and causing extensive damage to the reef. In March 2015, the Australian and Queensland's governments formed a plan for the protection and preservation of the reef's universal heritage until 2050. This 35 years plan, titled "Reef 2050 Plan" is a document proposing possible measures for the long-term management of the pollution, climate change and other issues that threaten the life span and value of this global heritage. The plan contains all the elements for measurement and improvements, including; long-term sustainability plan, water quality improvement plan and the investment plan for the protection and preservation of The Reef until 2050. However, whereas the 2050 plan aims to incorporate protective measures such as improving water quality, reef restoration, killing of predatory starfish, it does not incorporate additional measures to address the root cause the problem namely climate change (which is caused by greenhouse gas emissions). As such, experts doubt on whether it will be enough to save the fragile environment. 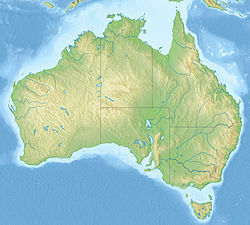 The Great Barrier Reef has long been known to and used by the Aboriginal Australian and Torres Strait Islander peoples. Aboriginal Australians have been living in the area for at least 40,000 years, and Torres Strait Islanders since about 10,000 years ago. For these 70 or so clan groups, the reef is also an important cultural feature. Royal Commissions disallowed oil drilling in the Great Barrier Reef, in 1975 the Government of Australia created the Great Barrier Reef Marine Park and prohibited various activities. The Great Barrier Reef Marine Park does not include the entire Great Barrier Reef Province. The park is managed, in partnership with the Government of Queensland, through the Great Barrier Reef Marine Park Authority to ensure that it is used in a sustainable manner. A combination of zoning, management plans, permits, education and incentives (such as eco-tourism certification) are employed in the effort to conserve the reef. In 1999, the Australian Parliament passed the Environment Protection and Biodiversity Conservation Act, which improved the operation of national environmental law by providing guidance about regional biodiversity conservation priorities. The marine bioregional planning process came from the implementation of this law. This process conserves marine biodiversity by considering the whole ecosystem a species is in and how different species interact in the marine environment. There are two steps to this process. The first step is to identify regional conservation priorities in the five (currently) different marine regions. The second step is to identify marine reserves (protected areas or marine parks) to be added to Australia's National Representative System of Marine Protected Areas. Like protected areas on land, marine reserves are created to protect biodiversity for generations to come. Marine reserves are identified based on criteria written in a document created by Australian and New Zealand Environment and Conservation Council called "Guidelines for establishing the national representative system of marine protected areas", also known as just "the Guidelines". These guidelines are nationally recognised and implemented at the local level based on the Australian policy for implementation outlined in the "Goals and Principles for the Establishment of the National Representative System of Marine Protected Areas in Commonwealth Waters". These policies are in place to make sure that a marine reserve is only added to the NRSMPA after careful evaluation of different data. The priorities for each region are created based on human and environmental threats and the Marine Bioregional Plans are drafted to address these priorities. To assess different region's priorities, three steps are taken, first, a bioregional profile is created, second, a bioregional plan is drafted, and third, the plan is finalised. After the plan is finalised, activity in different bioregions may become limited based on particular threats an activity may pose. In 2001, the GBRMPA released a report about the declining water quality in the Great Barrier Reef and detailed the importance of this issue. In response to this report, in 2003, the Australian and Queensland governments launched a joint initiative to improve the quality of water entering the Great Barrier Reef. The decline in the quality of water over the past 150 years (due to development) has contributed to coral bleaching, algal blooms, and pesticide pollution. These forms of pollution have made the reef less resilient to climate change. When the plan was introduced in October 2003, it originally contained 65 actions built on previous legislation. Their immediate goal was to halt and reverse the decline in water quality entering the reef by 2013. By 2020, they hope that the quality of the water entering in the reef improves enough so that it doesn't have a detrimental impact on the health of the Great Barrier Reef. To achieve these goals they decided to reduce pollutants in the water entering the reef and to rehabilitate and conserve areas of the reef that naturally help reduce water pollutants. To achieve the objectives described above, this plan focuses on non-point sources of pollution, which cannot be traced to a single source such as a waste outlet. The plan specifically targets nutrients, pesticides and sediment that make their way into the reef as a result of agricultural activities. Other non-point sources of pollution that are attributed to urban areas are covered under different legislation. In 2009, the plan was updated. The updated version states that to date, none of the efforts undertaken to improve the quality of water entering the reef has been successful. The new plan attempts to address this issue by "targeting priority outcomes, integrating industry and community initiatives and incorporating new policy and regulatory frameworks (Reef Plan 5)". This updated version has improved the clarity of the previous plan and targets set by that plan, have improved accountability and further improved monitoring and assessment. The 2009 report found that 41 out of the 65 actions met their original goals, however, 18 were not progressing well according to evaluation criteria as well as 6 were rated as having unsatisfactory levels of progress. Some key achievements made since the plan's initial passing in 2003 were the establishment of the Reef Quality Partnership to set targets, report findings and monitor progress towards targets, improved land condition by landowners was rewarded with extended leases, Water Quality Improvement Plans were created to identify regional targets and identified management changes that needed to be made to reach those targets, Nutrient Management Zones have been created to combat sediment loss in particular areas, education programs have been started to help gather support for sustainable agriculture, changes to land management practices have taken place through the implementation of the Farm Management Systems and codes of practice, the creation of the Queensland Wetland program and other achievements were made to help improve the water quality flowing into the coral reefs. A taskforce of scientists was also created to assess the impact of different parts of the plan on the quality of water flowing into the coral reefs. They found that many of the goals have yet to be reached but found more evidence that states that improving the water quality of the Great Barrier Reef will improve its resilience to climate change. The Reefocus summit in 2008, which is also detailed in the report, came to similar conclusions. After this, a stakeholder working group was formed that worked between several groups as well as the Australian and Queensland governments to update reef goals and objectives. The updated version of the plan focuses on strategic priority areas and actions to achieve 2013 goals. Also quantitative targets have been made to critically assess whether targets are being met. Some examples of the water quality goals outlined by this plan are that by 2013, there will be a 50% reduction in nitrogen and phosphorus loads at the end of catchments and that by 2020, there will be a reduction in sediment load by 20%. The plan also outlines a number of steps that must be taken by landholders to help improve grazing, soil, nutrient, and chemical management practices. There are also a number of supporting initiatives to take place outlined in the plan to help create a framework to improve land use practices which will in turn improve water quality. Through these means the governments of Australia and Queensland hope to improve water quality by 2013. The 2013 outlook report and revised water quality plan will assess what needs to be done in the future to improve water quality and the livelihoods of the wildlife that resides there. A Blue Starfish (Linckia laevigata) resting on hard Acropora and Porites corals. In July 2004, a new zoning plan took effect for the entire Marine Park, and has been widely acclaimed as a new global benchmark for marine ecosystem conservation. The rezoning was based on the application of systematic conservation planning techniques, using marxan software. While protection across the Marine Park was improved, the highly protected zones increased from 4.5% to over 33.3%. At the time, it was the largest Marine Protected Area in the world, although in 2006, the new Northwestern Hawaiian Islands National Monument became the largest. In 2006, a review of the Great Barrier Reef Marine Park Act of 1975 recommended are that there should be no further zoning plan changes until 2013, and that every five years, a peer-reviewed outlook report should be published, examining the reef's health, management, and environmental pressures. In each outlook report, several assessments are required. Each assessment has a set of assessment criteria that allows for better presentation of available evidence. Each assessment is judged by these criteria and given a grade. Every outlook report follows the same judging and grading process so that information can be tracked over time. No new research is done to produce the report. Only readily available information goes into the report so little of what is known about the Reef is actually featured in each outlook report. On 31 January 2014, the GBRMPA issued a dumping permit that will allow three million cubic metres of sea bed from Abbot Point, north of Bowen, to be transported and unloaded in the waters of the Great Barrier Reef Marine Park. Potential significant harms have been identified in relation to dredge spoil and the process of churning up the sea floor in the area and exposing it to air: firstly, new research shows the finer particles of dredge spoil can cloud the water and block sunlight, thereby starving sea grass and coral up to distances of 80 km away from the point of origin due to the actions of wind and currents. Furthermore, dredge spoil can literally smother reef or sea grass to death, while storms can repeatedly resuspend these particles so that the harm caused is ongoing; secondly, disturbed sea floor can release toxic substances into the surrounding environment. This approval is in line with the agency’s view that port development along the Great Barrier Reef coastline should be limited to existing ports. As a deepwater port that has been in operation for nearly 30 years, Abbot Point is better placed than other ports along the Great Barrier Reef coastline to undertake expansion as the capital and maintenance dredging required will be significantly less than what would be required in other areas. It’s important to note the seafloor of the approved disposal area consists of sand, silt and clay and does not contain coral reefs or seagrass beds. A long-term water quality monitoring plan extending five years after the disposal activity is completed. A heritage management plan to protect the Catalina second world war aircraft wreck in Abbot Bay. The establishment of an independent dredging and disposal technical advice panel and a management response group, to include community representatives. Due to its vast biodiversity, warm clear waters and accessibility from the tourist boats called "live aboards", the reef is a very popular destination, especially for scuba divers. Tourism on the Great Barrier Reef is concentrated in Cairns and also The Whitsundays due to their accessibility. These areas make up 7%–8% of the Park's area. The Whitsundays and Cairns have their own Plans of Management. Many cities along the Queensland coast offer daily boat trips. Several continental and coral cay islands are now resorts, including Green Island and Lady Elliot Island. As of 1996, 27 islands on the Great Barrier Reef supported resorts. In 1996, most of the tourism in the region was domestically generated and the most popular visiting times were during the Australian winter. At this time, it was estimated that tourists to the Great Barrier Reef contributed A$776 million per annum. As the largest commercial activity in the region, it was estimated in 2003 that tourism generated over A$4 billion annually, and the 2005 estimate increased to A$5.1 billion. A Deloitte report published by the Great Barrier Reef Marine Park Authority in March 2013 states that the Reef's 2,000 kilometres of coastline attracts tourism worth A$6.4 billion annually and employs more than 64,000 people. Approximately two million people visit the Great Barrier Reef each year. Although most of these visits are managed in partnership with the marine tourism industry, there is a concern among the general public that tourism is harmful to the Great Barrier Reef. A variety of boat tours and cruises are offered, from single day trips, to longer voyages. Boat sizes range from dinghies to superyachts. Glass-bottomed boats and underwater observatories are also popular, as are helicopter flights. By far, the most popular tourist activities on the Great Barrier Reef are snorkelling and diving, for which pontoons are often used, and the area is often enclosed by nets. The outer part of the Great Barrier Reef is favoured for such activities, due to water quality. Management of tourism in the Great Barrier Reef is geared towards making tourism ecologically sustainable. A daily fee is levied that goes towards research of the Great Barrier Reef. This fee ends up being 20% of the GBRMPA's income. Policies on cruise ships, bareboat charters, and anchorages limit the traffic on the Great Barrier Reef. The problems that surround ecotourism in the Great Barrier Reef revolve around permanent tourism platforms. Platforms are large, ship-like vessels that act as a base for tourists while scuba diving and snorkelling in the Great Barrier Reef. Seabirds will land on the platforms and defecate which will eventually be washed into the sea. The feces carry nitrogen, phosphorus and often DDT and mercury, which cause aspergillosis, yellow-band disease, and black band disease. Areas without tourism platforms have 14 out of 9,468 (1.1%) diseased corals versus areas with tourism platforms that have 172 out of 7,043 (12%) diseased corals. Tourism is a major economic activity for the region. Thus, while non-permanent platforms could be possible in some areas, overall, permanent platforms are likely a necessity. Solutions have been suggested to siphon bird waste into gutters connecting to tanks helping lower runoff that causes coral disease. The Great Barrier Reef Marine Park Authority has also placed many permanent anchorage points around the general use areas. These act to reduce damage to the reef due to anchoring destroying soft coral, chipping hard coral, and disturbing sediment as it is dragged across the bottom. Tourism operators also must comply with speed limits when travelling to or from tourist destinations, to prevent excessive wake from the boats disturbing the reef ecosystem. The fishing industry in the Great Barrier Reef, controlled by the Queensland Government, is worth A$1 billion annually. It employs approximately 2000 people, and fishing in the Great Barrier Reef is pursued commercially, for recreation, and as a traditional means for feeding one's family. Four traditional owners groups agreed to cease the hunting of dugongs in the area in 2011 due to their declining numbers, partially accelerated by seagrass damage from Cyclone Yasi. ^ a b UNEP World Conservation Monitoring Centre (1980). "Protected Areas and World Heritage – Great Barrier Reef World Heritage Area". Department of the Environment and Heritage. Archived from the original on 11 May 2008. Retrieved 14 March 2009. ^ a b "The Great Barrier Reef World Heritage Values". Archived from the original on 14 April 2013. Retrieved 3 September 2008. ^ Fodor's. "Great Barrier Reef Travel Guide". Archived from the original on 14 April 2013. Retrieved 8 August 2006. ^ a b Department of the Environment and Heritage. "Review of the Great Barrier Reef Marine Park Act 1975". Archived from the original on 18 October 2006. Retrieved 2 November 2006. ^ Sarah Belfield (8 February 2002). "Great Barrier Reef: no buried treasure". Geoscience Australia (Australian Government). Archived from the original on 1 October 2007. Retrieved 11 June 2007. ^ Sharon Guynup (4 September 2000). "Australia's Great Barrier Reef". Science World. Archived from the original on 8 July 2012. Retrieved 11 June 2007. ^ CNN (1997). "The Seven Natural Wonders of the World". Archived from the original on 21 July 2006. Retrieved 6 August 2006. ^ National Trust Queensland. "Queensland Icons". Archived from the original on 19 September 2006. Retrieved 17 October 2006. ^ Smee, Ben (20 February 2019). "Great Barrier Reef authority gives green light to dump dredging sludge". The Guardian. ISSN 0261-3077. Archived from the original on 21 February 2019. Retrieved 21 February 2019. ^ Eilperin, Juliet (1 October 2012). "Great Barrier Reef has lost half its corals since 1985, new study says". The Washington Post. Archived from the original on 14 April 2013. Retrieved 1 October 2012. ^ a b Access Economics Pty Ltd (2005). "Measuring the economic and financial value of the Great Barrier Reef Marine Park" (PDF). Archived (PDF) from the original on 14 April 2013. Retrieved 2 March 2013. ^ "Google Launches Underwater Street View". 16 November 2014. Archived from the original on 29 November 2014. ^ "Great Barrier Reef coral bleaching more widespread than first thought". The Sydney Morning Herald. 31 March 2016. Archived from the original on 3 April 2016. Retrieved 2 April 2016. ^ Jacobsen, Rowan (11 October 2016). "Obituary: Great Barrier Reef (25 Million BC–2016)". Archived from the original on 16 October 2016. ^ CNN, Sophie Lewis. "The Great Barrier Reef is not actually dead". Archived from the original on 12 March 2017. ^ Cave, Damien; Gillis, Justin (15 March 2017). "Large Sections of Australia's Great Reef Are Now Dead, Scientists Find". The New York Times. ISSN 0362-4331. Archived from the original on 20 February 2018. Retrieved 19 February 2018. ^ "Great Barrier Reef coral bleaching causes numbers of baby coral to plummet". abc.net.au. 4 April 2019. 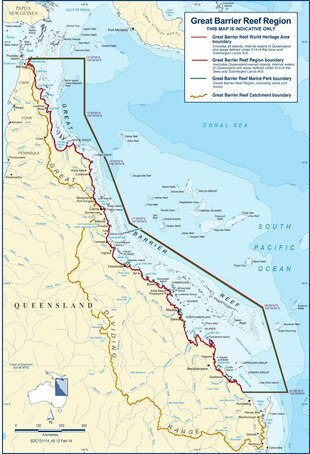 ^ a b "Great Barrier Reef General Reference Map" (PDF). Great Barrier Reef Marine Park Authority. September 2004. Archived from the original (PDF) on 9 April 2008. Retrieved 14 March 2009. ^ a b c d e f g h i j k l m n o p q r s Hopley, David; Smithers, Scott G.; Parnell, Kevin (2007). The Geomorphology of the Great Barrier Reef: Development, Diversity and Change. Cambridge University Press. ISBN 978-1-139-46392-8. ^ MSN Encarta (2006). Great Barrier Reef. Archived from the original on 1 November 2009. Retrieved 11 December 2006. ^ a b c Tobin, Barry (2003) [revised from 1998 edition]. "How the Great Barrier Reef Was Formed". Australian Institute of Marine Science. Archived from the original on 17 September 2010. Retrieved 22 November 2006. ^ a b c CRC Reef Research Centre Ltd. "What is the Great Barrier Reef?". Archived from the original on 22 August 2006. Retrieved 28 May 2006. ^ a b Great Barrier Reef Marine Park Authority (2006). "A "big picture" view of the Great Barrier Reef" (PDF). Reef Facts for Tour Guides. Archived from the original (PDF) on 20 June 2007. Retrieved 18 June 2007. ^ Harris, Peter T.; Bridge, Thomas C.L. ; Beaman, Robin J.; Webster, Jody M.; Nichol, Scott L.; Brooke, Brendan P. (1 March 2013). "Submerged banks in the Great Barrier Reef, Australia, greatly increase available coral reef habitat". ICES Journal of Marine Science. 70 (2): 284–293. doi:10.1093/icesjms/fss165. ISSN 1054-3139. Archived from the original on 20 February 2018. ^ Western Australia's Department of Environment and Conservation (2007). "The Devonian 'Great Barrier Reef'". Archived from the original on 11 September 2007. Retrieved 12 March 2007. ^ Great Barrier Reef Marine Park Authority. "Representative Areas in the Marine Park". Archived from the original on 28 September 2007. Retrieved 23 March 2007. ^ Great Barrier Marine Park Authority. "Protecting the Bioregions of the Great Barrier Reef" (PDF). Archived from the original (PDF) on 2 June 2011. ^ Great Barrier Reef Marine Park Authority. "Bio-region Information Sheets". Archived from the original on 31 August 2007. Retrieved 23 March 2007. ^ Nowak, Rachel (15 November 2002). "'Wonky holes' blamed for coral death". New Scientist. doi:10.1029/2002GL015336. Retrieved 17 April 2019. ^ CSIRO (2006). "Snapshot of life deep in the Great Barrier Reef". Archived from the original on 30 August 2007. Retrieved 13 March 2007. ^ a b Great Barrier Reef Marine Park Authority (2000). "Fauna and Flora of the Great Barrier Reef World Heritage Area". Archived from the original on 14 October 2006. Retrieved 24 November 2006. ^ a b c d e f g CRC Reef Research Centre Ltd. "Reef facts: Plants and Animals on the Great Barrier Reef". Archived from the original on 21 August 2006. Retrieved 14 July 2006. ^ Great Barrier Reef Marine Park Authority (2004). "Environmental Status: Marine Mammals". The State of the Great Barrier Reef Report – latest updates. Archived from the original on 2 October 2006. Retrieved 13 March 2007. ^ Dobbs, Kirstin (2007). Marine turtle and dugong habitats in the Great Barrier Reef Marine Park used to implement biophysical operational principles for the Representative Areas Program (PDF). Great Barrier Marine Park Authority. Archived from the original (PDF) on 18 July 2011. ^ Great Barrier Reef Marine Park Authority (2005). "Environmental Status: Seagrasses". The State of the Great Barrier Reef Report – latest updates. Archived from the original on 2 October 2006. Retrieved 23 May 2007. ^ Great Barrier Reef Marine Park Authority (2005). "Environmental Status: Marine Reptiles". Archived from the original on 2 June 2011. ^ a b "Appendix 4 – Other species of conservation concern". Fauna and Flora of the Great Barrier Reef World Heritage Area. 2000. Archived from the original on 31 August 2007. Retrieved 13 September 2007. ^ a b "Appendix 5 – Island Flora and Fauna". Fauna and Flora of the Great Barrier Reef World Heritage Area. 2000. Archived from the original on 31 August 2007. Retrieved 13 September 2007. ^ Great Barrier Reef Marine Park Authority. "Environmental status: birds". The State of the Great Barrier Reef Report – latest updates. Archived from the original on 28 September 2007. Retrieved 23 May 2007. ^ "Environmental status: birds Condition". The State of the Great Barrier Reef Report – latest updates. Archived from the original on 28 September 2007. Retrieved 23 May 2007. ^ Great Barrier Reef Marine Park Authority (2006). "Information Fact Sheets No.20 Coral Spawning" (PDF). Archived from the original (PDF) on 14 June 2007. Retrieved 27 May 2007. ^ a b c d e Harriott, V.J. (2002). "Marine tourism impacts and their management on the Great Barrier Reef" (PDF). CRC Reef Research Centre Technical Report No. 46. CRC Reef Research Centre. Archived from the original (PDF) on 18 March 2009. Retrieved 8 March 2009. ^ "AIMS Longterm Monitoring – Coral Diseases on the Great Barrier Reef – Skeletal Eroding Band". www.aims.gov.au. Archived from the original on 13 July 2009. Retrieved 22 August 2009. ^ Eilperin, Juliet (2 October 2012). "Great Barrier Reef has 'lost half its coral since 1985'". Washington Post. London: The Independent. Archived from the original on 3 October 2012. Retrieved 3 October 2012. ^ Rothwell, Don; Stephens, Tim (19 November 2004). "Global climate change, the Great Barrier Reef and our obligations". Melbourne: The National Forum. Archived from the original on 12 October 2007. Retrieved 26 September 2007. ^ Great Barrier Reef Marine Park Authority. "Our changing climate". Archived from the original on 29 October 2007. Retrieved 26 September 2007. ^ Great Barrier Reef Marine Park Authority. "Coral Bleaching and Mass Bleaching Events". Archived from the original on 20 April 2006. Retrieved 30 May 2006. ^ "Online version". The Daily Telegraph. 30 January 2007. Archived from the original on 26 February 2009. ^ Littman, Raechel; Willis, Bette L.; Bourne, David G. (2011). "Metagenomic analysis of the coral holobiont during a natural bleaching event on the Great Barrier Reef". Environmental Microbiology Reports. 3 (6): 651–660. doi:10.1111/j.1758-2229.2010.00234.x. ^ Great Barrier Reef Marine Park Authority. "Climate change and the Great Barrier Reef". Archived from the original on 8 December 2006. Retrieved 16 March 2007. ^ Schmidt, C.; Heinz, P.; Kucera, M.; Uthicke, Sven (2011). "Temperature-induced stress leads to bleaching in larger benthic foraminifera hosting endosymbiotic diatoms" (PDF). Limnology and Oceanography. 56 (5): 1587–1602. Bibcode:2011LimOc..56.1587S. doi:10.4319/lo.2011.56.5.1587. Archived from the original (PDF) on 4 March 2016. ^ "Coastal water quality" (PDF). The State of the Environment Report Queensland 2003. Environment Protection Agency Queensland. 2003. Archived from the original (PDF) on 14 June 2007. Retrieved 7 June 2007. ^ a b c d e "Human Impact on the Great Barrier Reef". University of Michigan. Archived from the original on 29 April 2013. Retrieved 12 February 2014. ^ Griffith, Hywel (28 November 2016). "Great Barrier Reef suffered worst bleaching on record in 2016, report finds". BBC News. Archived from the original on 28 November 2016. Retrieved 28 November 2016. ^ Great Barrier Reef Marine Park Authority. "Wetlands". Archived from the original on 2 October 2006. Retrieved 13 March 2007. ^ Brodie, J. (2007). "Nutrient management zones in the Great Barrier Reef Catchment: A decision system for zone selection" (PDF). Australian Centre for Tropical Freshwater Research. Archived (PDF) from the original on 25 March 2017. Retrieved 14 March 2009. ^ Australian Government Productivity Commission (2003). "Industries, Land Use and Water Quality in the Great Barrier Reef Catchment – Key Points". Archived from the original on 16 August 2008. Retrieved 14 March 2009. ^ Great Barrier Reef Marine Park Authority (2006). "Principal water quality influences on Great Barrier Reef ecosystems". Archived from the original on 16 October 2006. Retrieved 22 October 2006. ^ Milman, Oliver (12 February 2014). "Clive Palmer's nickel refinery pumped toxic waste into Great Barrier Reef park". The Guardian. Archived from the original on 23 February 2014. Retrieved 12 February 2014. ^ a b "CRC Reef Research Centre Technical Report No. 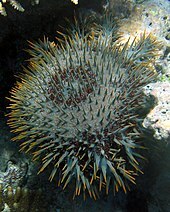 32 – Crown-of-thorns starfish(Acanthaster planci) in the central Great Barrier Reef region. Results of fine-scale surveys conducted in 1999–2000". Archived from the original on 29 August 2007. Retrieved 7 June 2007. ^ RRC Reef Research Centre. "Crown-of-thorns starfish on the Great Barrier Reef" (PDF). Archived from the original (PDF) on 26 August 2006. Retrieved 28 August 2006. ^ CSIRO Marine Research (1998). "Environmental Effects of Prawn Trawling". Archived from the original on 18 February 2006. Retrieved 28 May 2006. ^ Great Barrier Reef Marine Park Authority. "Great Barrier Reef Marine Park Authority :: Shipping". Archived from the original on 2 October 2006. Retrieved 13 March 2007. ^ Environmental Protection Agency/Queensland Parks and Wildlife Services. "About the Reef". Archived from the original on 15 August 2007. Retrieved 23 March 2007. ^ "Marine Safety Investigation Report – Preliminary – Independent investigation into the grounding of the Chinese registered bulk carrier Shen Neng 1 at Douglas Shoal, Queensland, on 3 April 2010". Australian Transport Safety Bureau. 15 April 2010. Archived from the original on 15 May 2010. Retrieved 14 May 2010. ^ "Coal being removed at sea from stricken Shen Neng 1 carrier". The Australian. News Ltd. 13 May 2010. Retrieved 13 May 2011. ^ "The Reef 2050 Plan". Department of the Environment and Energy. Australian Government. July 2018. Archived from the original on 4 March 2018. Retrieved 18 April 2018. ^ Loria, Kevin (1 May 2018). "Half of the Great Barrier Reef has died since 2016 — but Australia's $400 million attempt to save it doesn't address the main problem". Business Insider. Archived from the original on 21 May 2018. Retrieved 1 November 2018. ^ Slezak, Michael (25 May 2017). "Great Barrier Reef 2050 plan no longer achievable due to climate change, experts say". The Guardian (Australia). Archived from the original on 28 August 2018. Retrieved 1 November 2018. ^ Great Barrier Reef Marine Park Authority (2006). "Fact Sheet No. 4 – Aboriginal and Torres Strait Islander People and the Great Barrier Reef. Region" (PDF). Archived from the original (PDF) on 14 June 2007. Retrieved 28 May 2006. ^ Great Barrier Reef Marine Park Authority. "reefED – GBR Traditional Owners". Archived from the original on 14 April 2013. Retrieved 14 March 2009. ^ a b Great Barrier Reef Marine Park Authority. "Aboriginal & Torres Strait Islander Culture & Dugongs and Turtles". Archived from the original on 28 September 2007. Retrieved 23 May 2007. ^ Bell, Peter. "A history of exploration and research on the Great Barrier Reef". Australian Institute of Marine Science. Archived from the original on 16 October 2009. Retrieved 11 January 2010. ^ Queensland Museum. "HMS Pandora". Archived from the original on 29 August 2006. Retrieved 12 October 2006. ^ "Raine Island Corporation". Archived from the original on 2 November 2007. Retrieved 20 November 2007. ^ Commonwealth of Australia (1975). "Great Barrier Reef Marine Park Act 1975". Archived from the original on 23 February 2011. Retrieved 30 August 2006. ^ "Rewards Program". Onboard: The Tourism Operator's Handbook for the Great Barrier Reef. Great Barrier Reef Marine Park Authority. Archived from the original on 27 August 2008. Retrieved 14 March 2009. ^ "Fact Sheet – Marine Regional Bioregional Planning – The Process" (PDF). environment.gov.au. Archived from the original (PDF) on 14 March 2011. ^ "History". Archived from the original on 16 February 2017. ^ "Reef Water Quality Protection Plan 2009" (PDF). reefplan.qld.gov.au. 2009. Archived from the original (PDF) on 6 July 2011. ^ Great Barrier Reef Marine Park Authority (2003). "Zoning Plan 2003" (PDF). Archived from the original (PDF) on 21 November 2008. Retrieved 14 March 2009. ^ Fernandes et al. (2005) Establishing representative no-take areas in the Great Barrier Reef: large-scale implementation of theory on marine protected areas, Conservation Biology, 19(6), 1733–1744. ^ World Wildlife Fund Australia. "Great Barrier Reef – WWF-Australia". Archived from the original on 7 May 2010. Retrieved 10 November 2006. ^ BBC News (15 June 2006). "Bush creates new marine sanctuary". Archived from the original on 24 February 2011. Retrieved 28 December 2008. ^ "Great Barrier Reef Outlook Report". Great Barrier Reef Marine Park Authority. 2007. Archived from the original on 23 February 2011. Retrieved 31 August 2007. ^ "Great Barrier Reef Outlook Report 2009 in Brief" (PDF). Great Barrier Reef Marine Park Authority. 2009. Archived from the original (PDF) on 29 September 2009. Retrieved 10 June 2010. ^ Oliver Milman (10 December 2013). "Greg Hunt approves dredging off Queensland to create huge coalport". The Guardian. Archived from the original on 17 December 2013. Retrieved 18 December 2013. ^ a b c d Dermot O'Gorman (31 January 2014). "Dredge dumping: just because you can doesn't mean you should". ABC News. Archived from the original on 3 February 2014. Retrieved 1 February 2014. ^ "Marine Parks dredge dumping permit" (PDF). Great Barrier Reef Marine Park Authority. Archived (PDF) from the original on 11 February 2014. Retrieved 12 February 2014. ^ "Dredge dumping banned on Great Barrier Reef". Australian Geographic. 13 November 2014. Archived from the original on 29 November 2014. Retrieved 17 November 2014. ^ a b c d Great Barrier Reef Marine Park Authority (2005). "Protecting Biodiversity Brochure 2005". Archived from the original on 17 October 2006. Retrieved 11 November 2006. ^ Driml, Sally; Common, Mick (1996). "Ecological Economics Criteria for Sustainable Tourism: Application to the Great Barrier Reef and Wet Tropics World Heritage Areas, Australia" (PDF). Journal of Sustainable Tourism. 4 (1). Archived from the original (PDF) on 18 December 2008. Retrieved 31 October 2008. ^ Great Barrier Reef Marine Park Authority (2003). "Summary report of the social and economic impacts of the rezoning of the Great Barrier Reef Marine Park" (PDF). Archived from the original (PDF) on 20 September 2008. Retrieved 14 March 2009. ^ Ove Hoegh-Guldberg (14 March 2014). "Is Australia shooting itself in the foot with reef port expansions?". The Conversation. Archived from the original on 14 March 2014. Retrieved 14 March 2014. ^ Great Barrier Reef Marine Park Authority. "Number of Tourists Visiting The Great Barrier Reef Marine Park". Archived from the original on 27 February 2012. Retrieved 19 October 2011. ^ Great Barrier Reef Marine Park Authority (2005). "What You Do". Onboard – The Tourism Operator's Handbook for the Great Barrier Reef. Archived from the original on 20 September 2006. Retrieved 14 November 2006. ^ Saltzer, Rebecca (February 2002). "Understanding Great Barrier Reef visitors preliminary results" (PDF). CRC Reef Project B2.1.1: Understanding Tourist Use of the GBRWHA. Cooperative Research Centre for the Great Barrier Reef World Heritage Area. Archived from the original (PDF) on 25 July 2005. Retrieved 14 March 2009. ^ Hildebrandt, Amy (January 2003). "Understanding Tourist Use of the Great Barrier Reef: The Whitsundays Visitor" (PDF). CRC Reef Project B2.1.1: Understanding Tourist Use of the GBRWHA. Cooperative Research Centre for the Great Barrier Reef World Heritage Area. Archived from the original (PDF) on 25 July 2005. Retrieved 14 March 2009. ^ Great Barrier Reef Marine Park Authority (2005). "How is the Money Used?". Onboard – The Tourism Operator's Handbook for the Great Barrier Reef. Archived from the original on 20 September 2006. Retrieved 11 November 2006. ^ Lamb, Joleah; Bette Willis (August 2011). "Using coral disease prevalence to assess the effects of concentrating tourism activities on offshore reefs in a tropical marine park". Conservation Biology. 25 (5): 1044–1052. doi:10.1111/j.1523-1739.2011.01724.x. PMID 21848962. ^ Kight, Caitlin. "Are Coral Reefs Literally Sick of Ecotourists?". Archived from the original on 29 April 2012. Retrieved 15 March 2012. ^ "DUGONGS AND TURTLES". Archived from the original on 11 June 2014. Retrieved 3 June 2014. ^ "Turtle and dugong footage causes controversy". Archived from the original on 18 October 2016. Done, T.J. (1982). "Patterns in the distribution of coral communities across the central Great Barrier Reef". Coral Reefs. 1 (2): 95–107. Bibcode:1982CorRe...1...95D. doi:10.1007/BF00301691. Mather, P.; Bennett, I., eds. (1993). A Coral Reef Handbook: A Guide to the Geology, Flora and Fauna of the Great Barrier Reef (3rd ed.). Chipping North: Surrey Beatty & Sons Pty Ltd. ISBN 0-949324-47-7. 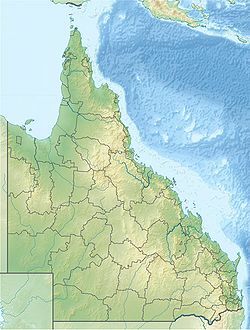 Capricornia Cays is both a national park and a scientific national park in Queensland (Australia), located 486 km and 472 km north of the state capital Brisbane respectively. Collectively they comprise 241 ha of coral cays. Green Island National Park is a protected area declared over a small coral cay of Green Island, Cairns Region, Queensland, Australia. It is known to the local Gungganyji Aboriginal peoples as Dabuukji. The Gungganyji people used the island as an initiation ground. The Coral Sea is a marginal sea of the South Pacific off the northeast coast of Australia, and classified as an interim Australian bioregion. The Coral Sea extends 2,000 kilometres (1,200 mi) down the Australian northeast coast. Great Keppel Island lies 15 kilometres (9.3 mi) from the coast off Yeppoon in the Shire of Livingstone, Queensland, Australia. It is part of the Capricorn Coast of Central Queensland. The island is the largest of the eighteen islands in the Keppel Group, and covers an area of 1308 hectares. It is within the local government area of Shire of Livingstone. The Florida Keys National Marine Sanctuary is a U.S. National Marine Sanctuary in the Florida Keys. It includes the Florida Reef, the only barrier coral reef in North America and the third-largest coral barrier reef in the world. It also has extensive mangrove forest and seagrass fields. The marine sanctuary includes a 2,800 square nautical mile (9,600 km²) area surrounding the Keys and reaching into the Atlantic Ocean, Florida Bay and the Gulf of Mexico. The sanctuary was established in 1990. Lady Elliot Island is the southernmost coral cay of the Great Barrier Reef, Australia. The island lies 46 nautical miles north-east of Bundaberg and covers an area of approximately 45 hectares. It is part of the Capricorn and Bunker Group of islands and is owned by the Commonwealth of Australia. The island is home to a small eco resort and an airstrip, which is serviced daily by flights from Bundaberg, Hervey Bay, Brisbane and the Gold Coast. The Ningaloo Coast is a World Heritage Site located in the north west coastal region of Western Australia. The 705,015-hectare (1,742,130-acre) heritage-listed area is located approximately 1,200 kilometres (750 mi) north of Perth, along the East Indian Ocean. The distinctive Ningaloo Reef that fringes the Ningaloo Coast is 260 kilometres (160 mi) long and is Australia's largest fringing coral reef and the only large reef positioned very close to a landmass. Reef HQ is the world’s largest living coral reef aquarium. It is located in Townsville, Queensland, Australia. The aquarium was built as a Bicentennial Commemorative project and is a part of the Great Barrier Reef Marine Park Authority (GBRMPA). The Coral Reef Exhibit has 130 coral species and 120 fish species along with hundreds of species of sea stars, sea urchins, sea cucumbers, brittle stars, feather stars, snails, worms and sponges. Tourism is one of the major industries in the Great Barrier Reef region. Approximately two million people visit the Great Barrier Reef each year. According to the WWF, tourism of the area contributes $5.4 billion a year to the Australian economy, and employs approximately 69,000 people. Ove Hoegh-Guldberg sees the key competitive advantage of the Great Barrier Reef as opposed to other, closer, reef tourism destinations is the region's reputation as being "the most pristine coral reef on the planet". The GBRMPA states that careful management, which includes permits for camping and all commercial marine tourism within the Great Barrier Reef Marine Park, has so far ensured that tourists have a very minimal impact on the reef.